A career in the fitness industry sounds like a great idea for those who enjoy regular sessions at the gym. Not only have you the chance to get more deeply involved in the world of exercise, and have an incentive to achieve peak fitness in order to operate at the high end of the market, but you have the opportunity to earn a very good living, too. However, it’s not simply a case of printing off a few hundred business cards, setting up a website, and finding the most eye-catching fitness clothing that you can find, along with a fetching baseball cap with “coach” stitched across the front. You’ve got to be well trained before you train anyone else, and that means qualifications. Given the size of the fitness industry in the United Kingdom, it was only logical to set up a national organisation to ensure that standards were as high as possible - step forward the Register of Exercise Professionals. Anyone contemplating a career in fitness should make this site their first port of call because it will give them all the information they need about the qualifications that are needed, and the differing levels of attainment, along with issues such as first-aid training and civil liability insurance requirements. All this information may seem like a lot to take in, but it is essential that prospective candidates absorb all the details in order to understand what is expected of them, and the amount of dedication it takes to pursue a career as an instructor. It’s not for the faint hearted, so those who believed they could breeze into the industry are likely to fall by the wayside straight away. This is all to the good because trainers need to meticulous in their preparation and dedicated to achieving high standards so that they can help clients reach their fitness goals. 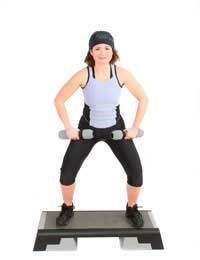 But enjoying a successful career as a personal trainer is more than simply gaining the necessary qualifications. It’s about being a great motivator, and a great communicator. Think about the best teachers you studied under at school or college and assess why you enjoyed working with them. Remember that the success or failure of a particular client will be down to you: you can’t huff and puff, or mutter in frustration, when they find it hard to complete a particular exercise or attain a set number of reps.
You must support them through the difficult moments when a lack of motivation or shortcomings in technical ability hold back their progress, so that when they cross that mental or physical finishing line, both of you can enjoy that feeling of elation that comes from achievement. If you plan to operate as a freelance, remember that you will be classed as a self-employed person and, therefore, will have to notify HM Revenue & Customs as to your change of status. So take the time to absorb the relevant information at the tax authority’s website. So there you have it: personal training is definitely not for the enthusiastic amateur hoping to make a little extra cash. Rather, it’s about being ultra professional, thereby ensuring the safety and enjoyment of clients. Their success will be your success. Now that’s what you call job satisfaction.